Despite the obvious pitfall, that, er… we are not mice, researchers use these models to try and isolate the previously confounding variables as much as possible, and figure out the mechanism underlying an assumption. These studies usually go like this: separate mice into several groups. Feed one group diet A (let’s say, standard delicious mouse food) and the other group diet B (standard delicious mouse food + 10% candy cane). Inject them with a known carcinogen, and observe which group develops more tumors. Then, the researchers publish the paper, and the public hears about it through the media. Let’s take our present case of high-fat diets. I’m not going to go into observational studies because their results are very weak and questionable, at best. 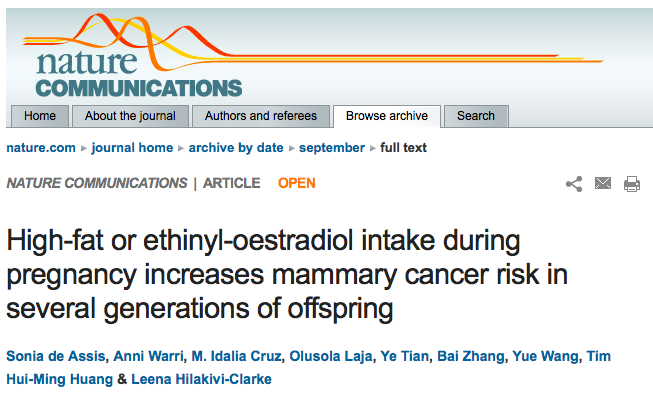 Mouse-based studies, on the other hand, make for great media headlines. My problem with these mouse-based ‘high fat’ studies is two-fold: researchers fail to make a difference in what type of fat is used in the titles of their papers, and journalists lack the scientific knowledge to fully understand the research. They write about it and scare people into throwing their butter away and buying margarine. The thing is, all fats are not equal. Most published studies which have for title: “high-fat diet causes this horrible thing in rats” should be re-named “A corn oil based, high omega-6 diet causes this horrible thing in rats”. 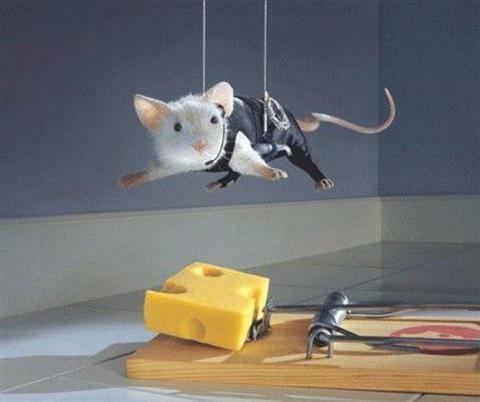 For some reason, corn oil seems to be the feed of choice in ‘high-fat’ rat experiments. Well…. 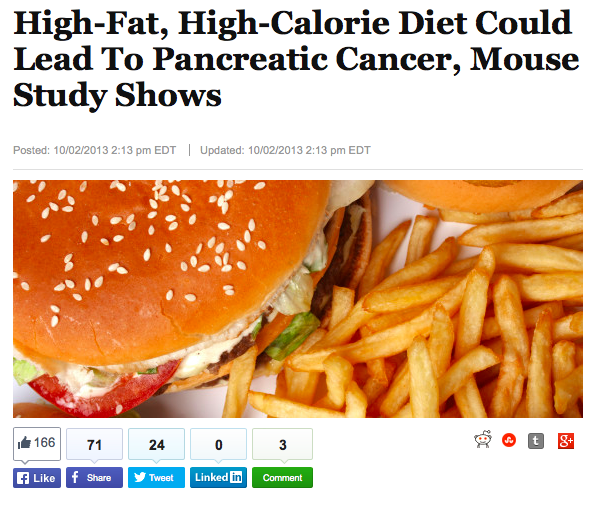 OF COURSE a high omega-6 diet will cause more tumor growth in rats. Corn oil is 54% omega-6 and 0% omega-3s. If you leave the rats’ diets unchanged from the control group and just add a whole bunch of omega-6s, no wonder they will get sicker, because Omega-6s increase inflammation. (Have a look at my previous article which explains this in more detail). They changed nothing, except quadrupled the amount of corn oil for the High Fat diet group. In this research experiment, rats which had been fed the same diet as the control group + 15% corn oil developed more virulent prostate cancer. And here, in the first few paragraphs of the paper, you find, blatantly, “fat source: corn oil”. But hey, research is GREAT. It’s very important to prove through mice-based models that corn oil, because of Omega-6s, promotes inflammation and cancer. It is just dangerous to call a paper “high-fat” when it’s actually “high Omega-6”, and even more dangerous when the media makes the same mistake. So, throw your corn oil away, always dig into the source before believing these kinds of articles, and pop some of those fish oil pills. Excellent point. Recently there was this media coverage of the “Cancer is mostly Bad Luck” paper which of course was not true. We have to be very careful and read the original research before making any health decision. See the article on the case in the Economist of last week. Absolutely. Although the researchers did say in the abstract of their paper “The majority is due to ‘bad luck’ ”– dangerous soundbite to give to the media… Thanks for sharing.